According to Steve Clinefelter, President of California Fitness, “One person has the ability of producing 50 watts of electricity per hour when exercising at a moderate pace….If a person spends one hour per day running on the machine, he/she could generate 18.2 kilowatts of electricity and prevent 4,380 liters of CO2 released per year.” We love the idea of burning calories in order to NOT burn fossil fuels. The “Powered by YOU” program enables users to improve their health and the environment—one step at a time. i've used a rowing ergometer to generate 46,600+ watts in a 41-minute setting. i bet the variables will be increased through a sustained usage. in 1981, i sustained a severe closed head-injury in a car accident. to overcome these deficits, i found regular workouts on rowing machine to be an efficeint way to strengthen my arms, legs, lungs and heart that were weakened by said injury; yet, why isn't this method used to decrease our dependency on oil produced overseas and increase the strengths or abilities of the american at-large populations? Honestly, I really like and definitely believe your article in here. I really hope more author totally have precisely the same thinking just like you. A great looking idea... but here you see how pitiful the human output is. (John\'s calculation from March 2007 is terribly wrong, the actual figure of tonnes of oil equivalent in his example would be less than 0.17 tonne, instead of several thousand that he arrived to). While fun, this has negligible impact on our energy needs, building the additional equpiment needed to extract energy from training machines costs more energy than it would ever bring. This concept has taken over the world. I've heard it being used in a City jail in the Philippines to power the lights of the prisoners at night. Even in Texas City Jail they also require the inmates to use the stationary bikes that powers the TV they watch! Just saw a summary of the concept being used here dogengine.com/used-stationary-bikes.php do scroll at the very bottom of the article to see the summary that I'm talking about. I am trying to Make Western State College of Colorados Fitness Center more green. I want to find out how to get energy making bikes. Do you have any ideas on how I should go about this? Bonjour, Tout d'abord bravo pour cette super idée, à exploiter! Je souhaiterais plus de renseignements sur le rendement de ces machines, et sur une éventuelle utilisation en France, pour un nouveau concept de salle de sport. Merci! Good idea, like little cute mice running on the wheels. At this point, exercise bike are more efficiency that treadmills especially the electric treadmills. Like my friend did, use lifespan exercise bike as power generator to provide energy for the treadmill. Brilliant ideas. lovely, i agree with stephen that building a model from the ground up to capture the most movement should be key. should this technology be use for prisons? I would love to get involved in this idea. Yes, there is the issue of calories burned to create the power, but no form of power generation can defeat the laws of thermodynamics. The point is, people are going to be exercising anyway so it's better to capture that power for something rather than nothing. Of course, each calorie of food energy you burn requires about 10 calories of fossil fuel to produce (at least in the US), so this is going to be a losing proposition climatically and energetically. See Michael Pollan's book, The Omnivore's Dilemma. This is what happens when you don\'t pull your finger out after a brainstorm! I have diary notes of my invention from 1993. The only difference with my system is that it\'s grid connected and each user has a swipe card which they swipe on whatever machine used which stores relevant information such as joules expended and converted to electrical energy over time. This is a good motivation tool for the user and educates the user on energy transfer in regards to the energy content of food they eat and then converted to mechanical to electrical energy. My grand vision is seeing huge gyms one day used as charging stations for the inevitable electric car. Oh well, better to see it out there than not at all! Good on ya Lucien! Is it possible to send the electricity generated back out to the grid and sell it to utility companies? I don't see the benefit in turning on a useless light in the gymnasium. Plus, that would elimate the costly battery pack. What about resistance machines besides cardio stuff? For example, Lat pull down machines, leg presses, chest presses, etc. I am currently designing an eco-friendly wellness center and i was just wondering if i design it with the "human powered" in mind, can we spec just any cardio machines to do this or would it have to be a certain one? Lucien, Well, you have stolen my idea. But that's OK. I am thinking of a slightly different approach. It seems to me that the machines that we use in gyms today do not translate potential human energy as efficiently as they could. In other words, for this idea to really have greater impact we would need to design some new machines from the ground up. For example, while cardio-machines are the obvious best use for now, they don't make full use of upper body capacity for generating power at the same time as the legs are generating power. New machines that take advantage of whole body motion could double the possible output on a per machine basis. And combining that with possible efficiencies in translating the energy (smoother gear ratios, less friction, etc.) might produce even better outcomes. Thanks and good luck! Bravo! You cannot stop people from going indoors to exercise, even if it is nice outside. By using the human to power or replace some of the power used to operate the machine, it will only reduce the amount of power that would have normally been used at the gym. This wil also start an attitude towards users going "green", and possibly make a real difference. Have you contemplated using an access card which records the amount of energy produced by the user, and then give a "refund" back to the user? By recording the time the user is exercising, there may be a way to get insurance companies to pay for some or all of the gym use in order to reduce the user's future health problems (AKA: Preventative Maintenence). I had this idea and was searching the net to see if it had been done! Just imagine if ALL gyms across the world converted their cardio machines to generate electricity, Wow! I think this is a great idea. I remember seeing the concept in a movie a few years ago where a guy had three different types of exercise machines hooked up to power his t.v. Thats actually what I was looking for when I found this site. Can this be done? I would like more info on this technology. And as for all of you people being so negative ni picking about how out put of energy and people at the gym. People will go to the gym either way. Wouldn't it be better if this technology was at every gym thereby still saving some energy? We need to keep developing this technology and passing it around so that people can use it and improve on it in time. Hi Lucien, You have good reasons to be proud of these clever energy saving initiatives, regardless of how small they may seem. However, I would like you to clearlify one thing, you say "when one user produces 50 wh we save 150 watts (aircon-lighting)". How can this be? Isn't it really the other way around? When a user enters your gym, lights get turned on (from your video it looks like approx. 60 W), in addition the mere presence of the user adds a 150-200 W of body heat radiation extra load to you air conditioning system (depending on degree of physical activity of the user). By tapping some of the power generated by the user you are cutting the 210-260 W loss caused by each user. If your users, instead of going to your gym, would decide to bike in the park or jog at the beach they'd actually save you more than 5 times more CO2! But maybe your climate is already too hot for outdoor activites. Please let me know if I've misunderstood your reasoning! I am interested in bringing this to a chain of clubs in Australia. Can someone provide me with details of how I can get in touch with the guys responsible? Thanks. How about pedal powered computers or televisions, or somesuch? That'll give people more motivation than mere fitness. This is a great idea! I would love to see some of this equipment for home use so that we can power our computers or home appliances with power from our treadmills or turbo trainers. I don't mind if the energy we can produce is low at first - at least we are doing something for our enviroment even though it is small. I am sure that there are a lot of green consumers out there that can make this happen. The more we focus on green technology the better it will become. I hope to see a gym like this in the UK soon! I would certainly consider signing up. If you are into DIY experimentation, you can do build your own electricity-generating exercise equipment with widely available rare-earth magnets. Take a look at www.otherpower.com, especially the wind and experiments page. goodbye obesity... hello green power! This is fabulous! My friend was talking about this exact idea last Spring. I'm looking forward to seeing more of this. Could we have an option that allows gentle exercise at desks to power laptops/ desktop computers? This is terrific! I have recently been thinking that elected representatives might be able to use their own time better when sitting, hour after hour, in all the various hearings that they have to endure. I have suggested that if they sat instead on excercycles that it would be a great way for them to stay in shape! Instaed of the current approach of sitting on their rear ends for hour after hour. And now, if this energy generating component could also be added? Wow. This would be a fantastic reform... on several fronts! Other than that... my additional comment would be this: Why are the folks who comment here always so negative? Every great invention and/or social reform had to start someplace, right? How about projecting some positiveity on these efforts instead of always carping on all the less-than-perfect aspects of a certain idea? I bet it costs as much, or nearly as much, energy to produce and maintain the equipment required to do this than the exercisers will produce in their lifetime. Same problem as hybrid cars -- using more expensive technology to become more efficient doesn't make sense. Turning off some of the lights in the gym would help more. Brian Eno had this idea too, it was in his book/diary A Year. I think it's great. No pain, no gain, right? At this gym, the new mantra may be "no pain, no power." Just as the Sustainable Dance Club is turning dance steps into energy, French inventor Lucien Gambarota and Wharton grad and entrepreneur Doug Woodring are bringing clean, sustainable energy to the gym using good old-fashioned manpower. The two have joined forces with Hong Kong's California Fitness, a subsidiary of 24 Hour Fitness Worldwide, to launch a revolutionary concept in which energy burned off by exercisers is diverted and converted to power lighting fixtures, while excess energy is stored in a battery. 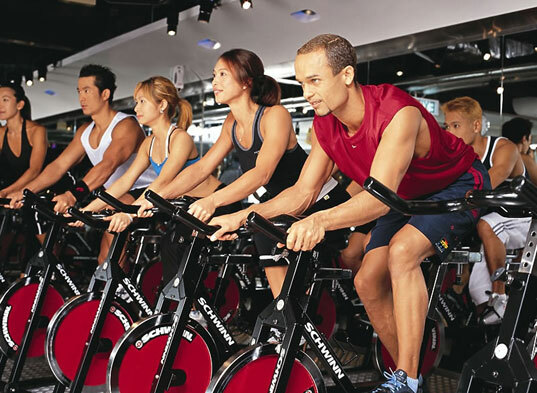 The gym's 13 step, cycling and cross-training machines in the "Powered by YOU" program are popular with members. As gym member Rita Wong states, "It's very good motivation. You can watch yourself burning fat to turn on the light."